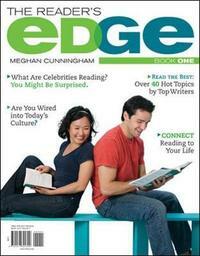 "The Reader's Edge: Book I" approaches reading holistically while focusing on discrete skills. The text stresses that reading, thinking, and asking questions are all things students do already - not new concepts. This emphasis on reading as a part of the student's world is then paired with strong skills-based instruction. "The Reader's Edge: Book I" is part of McGraw-Hill's new M-series of textbooks that are inexpensive, lightweight (400-450 pages), and designed to reflect the way today's students read and study. The text is designed visually to appeal to students while conveying the key concepts of developmental reading in a way that they can relate to and apply to their daily lives. This book allows you, the instructor, to meet students where they are, so you can take them where they want to go.